Hands up if you like shopping in foreign grocery stores when you go away on holiday? Or even just a different store in your hometown on occasion? I knew I liked you! The best part of exploring is finding items that you love, but are not typical to your locale. For me, poking about in food stores is like an adventure hunt and when I find treasure, I can generally buy because, unless we are talking truffles or caviar, most grocery items are quite affordable. Take, for example, my stock cube collection. You see here just a few of my purchases from Brazil, Malaysia, Spain, and the United Kingdom among other places. I love to use stock cubes instead of salt because they add flavor as well as saltiness to dishes. (And, yes, most contain MSG, but no one in my family is in the small percentage of the population that has an intolerance to this flavor enhancer.) In this soup, I used a ham cube because I didn’t have a ham bone to boil to make my own broth, but I wanted to share this in case you have a bone-in Christmas ham. 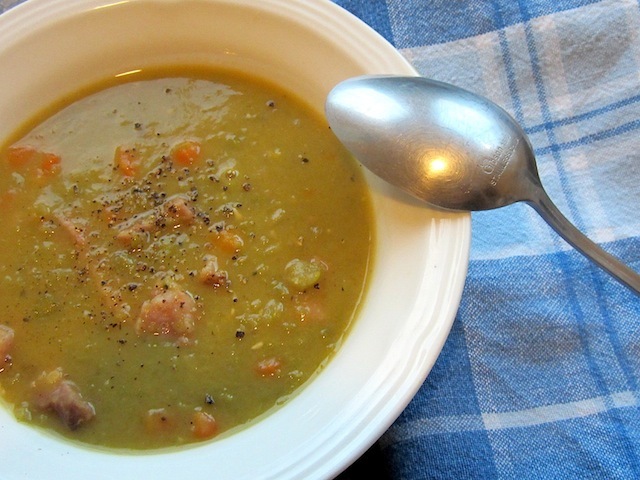 Ham and split pea soup is delicious and a great use of leftover ham. This will make two or three hearty bowls but is easily doubled to feed more. Just double the other ingredients and boil your ham bone for longer, with more water. If you don’t happen to have a ham stock cube, put your ham bone in a pot of water with the teaspoon of salt and bring to a boil. Simmer covered for about one hour or until all the meat is falling off the bone. Turn off the heat and remove the bone from the pot and allow to cool enough for you to take all the ham off the bone and discard (Read: feed to your helper dog.) the grizzly bits. Set aside. Peel and chop your onion and carrot. Cut your ham (either from the simmered bone or from leftover boneless ham or both!) into pieces. In another pot (or for those of you with a ham stock cube, the only pot) sauté the onion and carrot in a little olive oil until the onion is translucent. 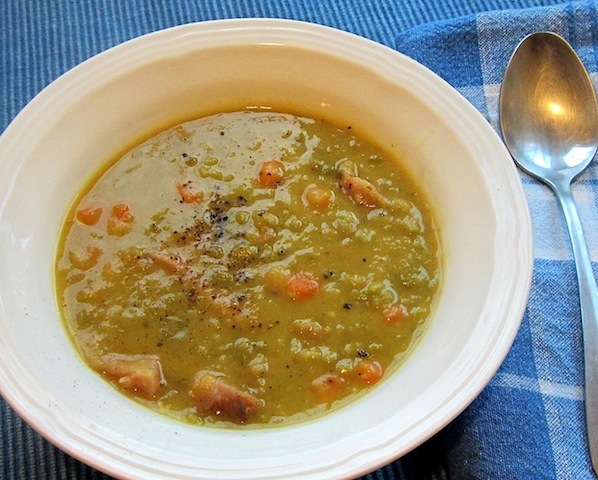 Add in your dried split peas and the ham cube along with about six cups or 1 1/2 liters of water (or stock from your recently boiled ham bone, if using and skip the cube.) Give the pot a good couple of grinds of black pepper from your pepper mill. Bring to a low boil and skim the scum off of the top of the pot with a shallow spoon. 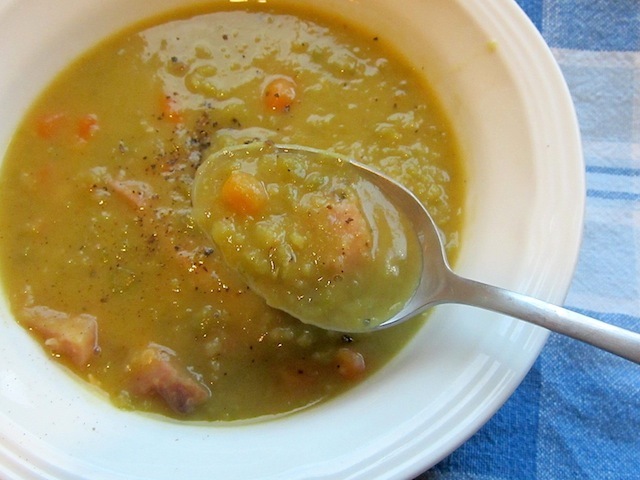 Cook over a low to medium heat until the split peas are cooked through and are turning soft. This could take as few as 30 minutes or as much as an hour, depending on the freshness of your dried split peas. At this point, if you would like a very smooth soup, you can puree it in a blender or with a hand blender straight in the pot but do be careful not to scald yourself. I prefer a chunkier soup so I just use a whisk straight in the pot to break up the split peas somewhat, while leaving some relatively intact. Add in the ham pieces and simmer for another 20-30 minutes. Stir occasionally and watch for scorching because once the split peas have broken down, they tend to catch on the bottom of the pot. Add some more water if your soup is getting thicker than you like. Check for seasoning and add a little more salt if necessary. Give the whole pot another good sprinkle of freshly ground black pepper. Holy Cow! How did I miss this? Must be because it was so close to Christmas. Look at all those little cubes? I'm going to have to look beyond my regular chicken and beef now, so I can play show and tell with you!! Aren't they FUN?! Do you have Fiesta grocery stores in Oklahoma? Sometimes they have a wider range than, say, Kroger.